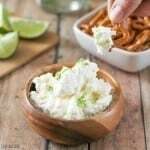 Home » Margarita Dip with Salted Pretzels For A Cocktail You Can Eat! Who doesn’t love margaritas?!? What if you could have one of your favorite cocktails in a dip? Now you can! 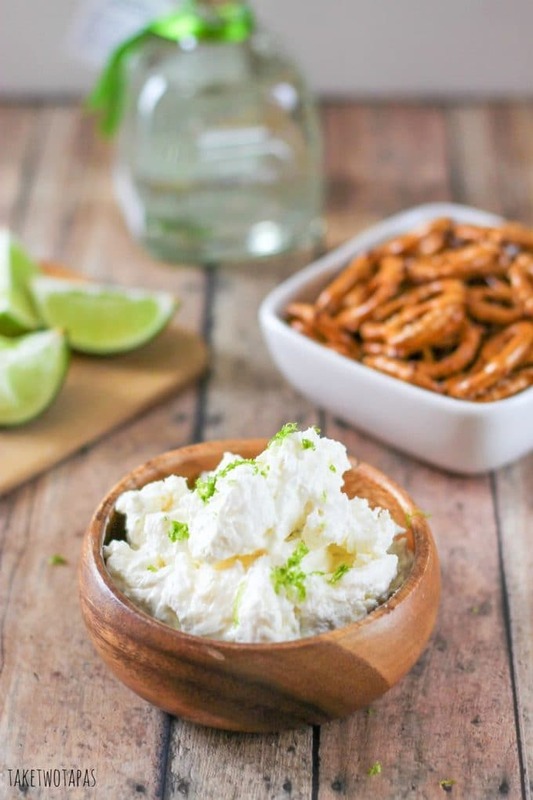 This bright and creamy margarita dip is full of the flavors of lime and tequila and the perfect amount of salt when served on top of a salted pretzel! I used to think that tequila and I were friends. Not anymore. After one night that I can’t fully recall, tequila left me with a fuzzy memory, a raging headache, and a mysterious bruise on my forehead. Since that night, I can’t really handle tequila. Sipping or shots. What am I to do when I can’t handle a much-beloved spirit? Make it into a dip where I can still enjoy the taste without the fallout! How does Margarita dip sound? This creamy mixture starts off with butter and cream cheese. You know, something light! Just remember that calories shared with friends don’t really count. Feel free to eat the whole bowl! Another dip you might like is my Oreo Cheesecake Dip. Sounds good too, doesn’t it? It comes with homemade chocolate wafers to boot! Once you have mixed those two wonderful ingredients, add your liquor of choice. You can use tequila like a traditional margarita, or you can use lime liqueur. I found this wonderful spirit next to the tequila in the store. It has a smooth finish and tastes like a bright lime! Don’t forget the triple sec or it wouldn’t be a true margarita, and then I would be lying if I called it margarita dip. After adding in the spirits, you need to balance out the dip with some sweetness! Mix in your powdered sugar and fold in your whipped topping to smooth it all out. A few passes of lime zest and you are ready to eat. I use this zester so I can the most amount of zest and for limes that are close to being past their prime, I zest and juice the limes and store the zest and juice separately in these containers in the freezer. Why waste good zest? 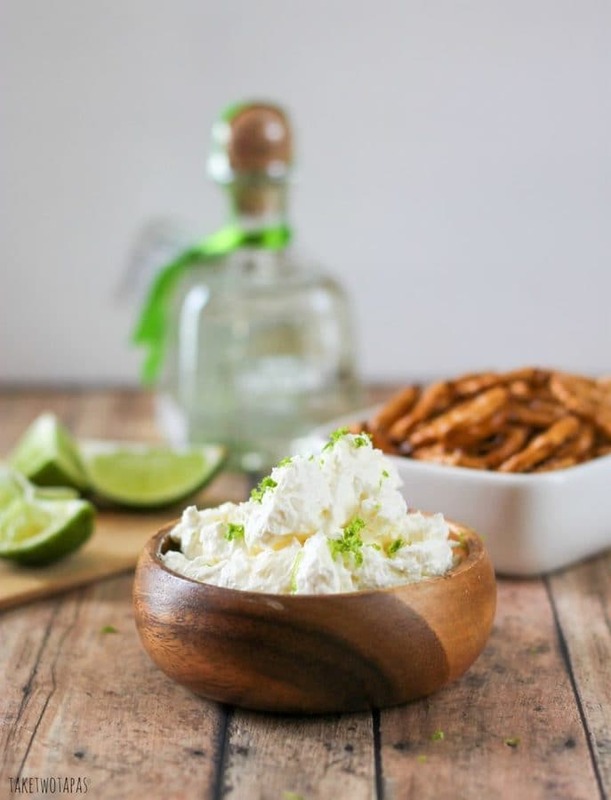 Be sure to serve this Margarita Dip with some salted pretzels for the full flavor profile. I like the twists for the margarita dip so I can get as much on the pretzel at one time. The sticks just don’t do it justice! 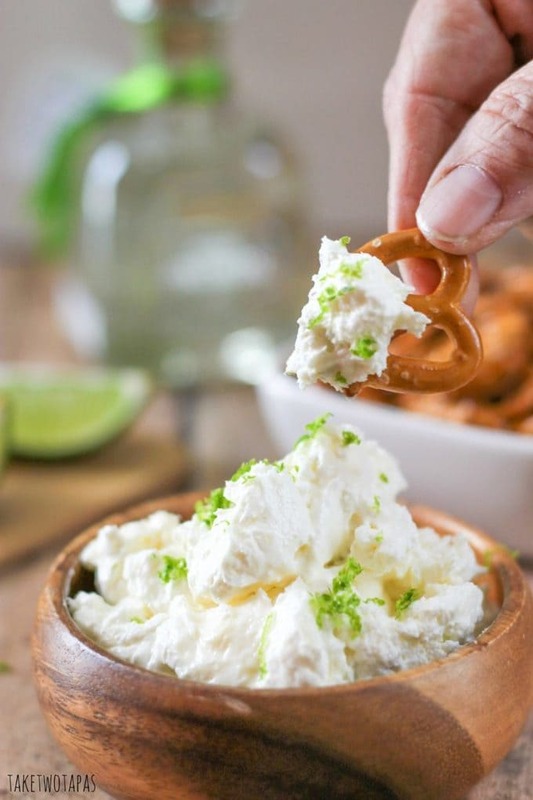 This bright and creamy margarita dip is full of the flavors of lime and tequila and the perfect amount of salt when served on top of a salted pretzel! Add in the triple sec and spirit of your choice (tequila/lime liqueur) and stir to combine. When all the above is combined, fold in the whipped topping. Place in serving dish or store in the refrigerator until ready to use. Margarita Dip is perfect for your next cocktail party too! « Take Two Tapas Top 10 of 2015! 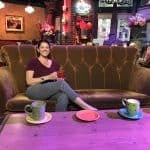 This is a crazy idea (in a good way!) I love it!! Thanks for bringing this by Throwback Thursday! This looks all sorts of amazing! Thanks for linking up to What’s Cookin’ Wednesday! What a fun idea! Thanks for sharing on the Creative K. Kids Tasty Tuesdays Linky Party. I hope you will join us again next week. I love anything involving a Margarita- this would be so much fun to bring to a party! Eat your cocktails!!! Reminds me to tell myself that Bloody Marys are technically a lunch with all those veggies! Wow…this recipe sounds (and looks) so delicious! I’m definitely pinning so I can make it sometime soon!!! Thanks so much for sharing with us at Share The Wealth Sunday! Thanks so much! I will do that! You rock! 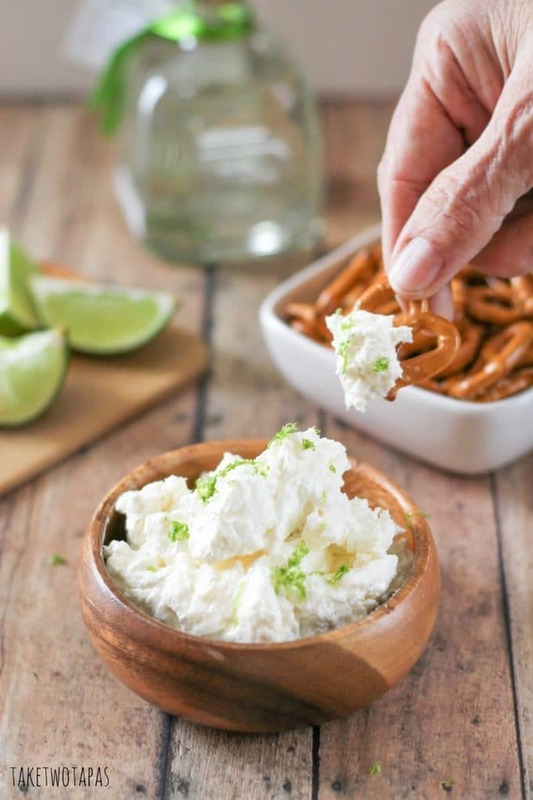 What a great way to use your favorite cocktail in dip form! Thanks so much for sharing at Oh My Heartsie Girls Wordless Wednesdays! Sweet, savoury and boozy, this dip has all the main ingredients for a delicious party. I hope you like it! I am hoping to get back in good graces with tequila soon! This looks so delicious! Thanks for sharing it at The Pretty Pintastic Party! We enjoyed it so much we are featuring it at this weekend’s party. Stop by, grab a featured badge, and link up some more awesome posts! Thanks so much!!! I will do that! This sounds amazing! Tequila and I don’t get along either, but substituting it with the lime liquor is something I probably can handle. Thanks for sharing at Manic Monday!! This is seriously one of the most awesome things I have ever seen. I CANNOT wait until this baby is out so I can try this!! Thanks Morgan! I hope you like it! Wow, this is super creative! Thanks for sharing at #HomeMattersParty! Thanks Hannah! And thanks for a great party! This sounds amazing, love the suggestion of lime liquor too! What a fun dip. I am sure it would be a huge hit at our ladies night. Thanks for reading Christie! I hope you guys devour it! See now I’ve had the opposite experience with tequila. I used to hate it, but now tequila and I are friends. Speaking of friends, I’ll have to make this at my next girls night in. My friends would love this.